It's usually not a problem because it's an installer and we run it once and it goes away. 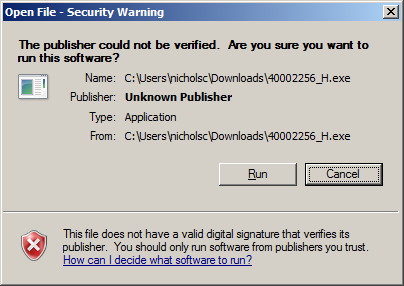 But what if it's a portable executable? Just exactly WHERE in the heck is this data stored? NTFS has a feature called Alternate Data Streams (ADS) which is where this security information is stored. Grab a copy of the SysInternals utility streams to remove this offending data if you plan to keep the file around but don't want to completely disable the security feature.